Sonos launches wireless Play:3 speaker system for £259 | What Hi-Fi? On Monday Amazon in the US accidentally let slip some info about Sonos’s new smaller Play:3 multiroom speaker system, but today we can bring you the full details. The Play:3 speaker is the most affordable Sonos product to date, at just £259. It’s a smaller sibling to the Sonos S5 (now rebranded Play:5 at £349) and sports three drivers plus a bass radiator, and a compact design. The speaker can be used on its own, or as a pair for stereo sound, and can also be flicked between vertical and horizontal, changing their tonal balance as they do so. With a new brand logo to match the new names, it marks a fresh onslaught on the ‘wireless hi-fi’ (Sonos’s preferred term) market. The Play:3 is available in black or white, and is fitted with three digital amps driving a tweeter, two midrange speakers and a bass radiator. 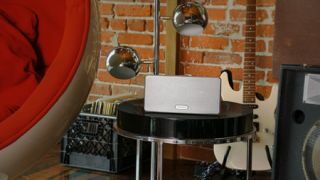 Designed for smaller rooms, a basic Sonos system comprising of one Play:3 (£259) and a ZoneBridge (£39) can now be had for £298. Additional Play:3s can be added as the user decides to expand the system to other rooms around the house. There are free Sonos iPhone/iPad and Android apps to control the system, and an Ethernet connection for those who prefer to hard wire their multiroom system. However, the Apple AirPlay extension available on the Play:5 is not available on the Play:3, and there's no line input. “The development of the Play:3 means we can now compete with the likes of the Bose SoundDock and B&W Zeppelin,” says Sonos EMEA PR manager Fiede Schillmoeller. Also new is an update for the Sonos Controller for Android. Available immediately, the v3.5 software update crucially now allows users to install the app to an SD card, freeing up space on your mobile's hard disk.